The 20-year-old had a difficult debut in the Premier League last weekend as he conceded two penalties in Spurs' 3-2 win over Wolves. However, he responded positively against Palace and headed in the winner after 66 minutes at Selhurst Park. 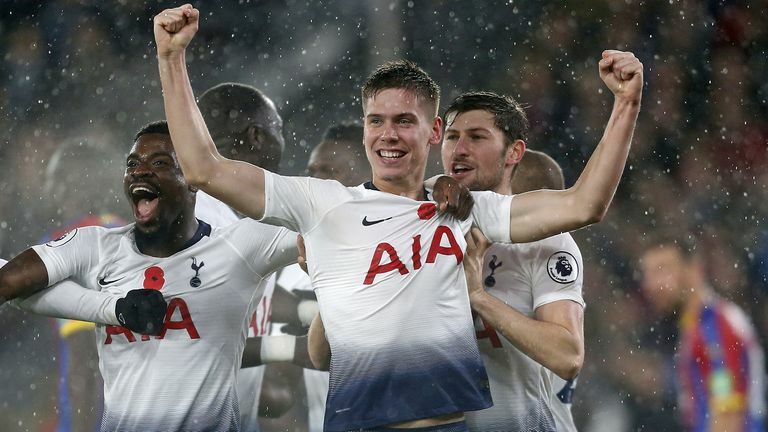 Asked if he had any doubts about Foyth after the Wolves game, Pochettino said: "No, no doubts. He was very disappointed because he felt responsible, but that's a job for the coaching staff and the people around. "We have experience in this kind of situation as we were players. Look, we just laugh about that situation because to improve you need to make mistakes, and only making mistakes can you find what it means, and that is going to help him to not repeat again the same situation. "He is so clever and he has a lot of potential. He has quality and I don't have doubts that he only needs time, and games to improve and show his real quality." The win at Palace was Tottenham's seventh victory from eight away Premier League matches this season. They are still unsure when their new stadium is going open, but Pochettino says fans should be patient and should be excited. "When I saw the stadium I was like 'wow'. "It's difficult to talk because it is beautiful and amazing. I think it will be an amazing place to enjoy football for our fans, and players. "I am a little bit jealous for the players because playing there, and to be in a locker room like this, and to be in a place where the new stadium is going to be, is amazing. It's massive. I would like to be a 20-year-old and to be a player, and Tottenham offer me a contract to play because it is going to be amazing. "Again, I would say to fans to be patient because it is going to be the best stadium in Europe for sure."